When an election campaign is on, candidates, their supporters and political parties say all manner of things against their opponents. It is understandable. But once the election is over, the defeated candidates are expected to congratulate the winner and cooperate with the new government or arm of government for the benefit of the larger society. The defeated ones may even win the next round of election. President Muhammadu Buhari, for instance, won the 2015 vote after attempting three times. Anambra State has since 2017 been exemplary in democratic governance. Candidates of the major parties defeated by Governor Willie Obiano in the storied November 17, 2017, gubernatorial vote wasted no time in publicly congratulating him over his overwhelming victory in each of the 21 local government areas of the state, which earned him the sobriquet of “21 over 21 Governor.” This was quite remarkable in a state notorious for election litigation, sometimes up to the ECOWAS Court. Olusegun Adeniyi reports ex-President Goodluck Jonathan in the book Against the Run of Play as saying that aspirants vying for the same public office from the same party in Anambra State often have as many as three court judgments declaring each the authentic candidate! It is wonderful that Anambra has changed. The state was easily the most peaceful throughout the 2019 general election in the country, which has virtually come to an end. Even “jaw-jaw” (as opposed to “war-war”), which is normal even in advanced democracies, was almost absent, making our conduct the most civilised in the country. Political controversies were reduced to the barest minimum. But there are unfortunately a handful of elements still steeped in the older of extreme bitterness and bickering long after an election is over. 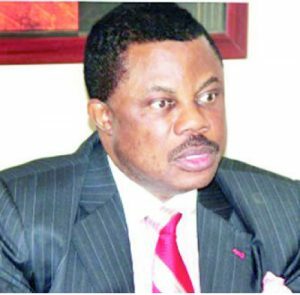 A few days ago, a group of barely literate e-rats posted a fake news item claiming that Governor Obiano has followed in the footsteps of the outgoing Imo State governor, Rochas Okorocha, by defecting from the All Progressives Grand Alliance (APGA), on which he was elected governor, to the All Progressives Congress (APC), the Federal Government party. This fake news was posted the first time during the 2019 electioneering by a group closely associated with a prominent candidate from the state in the election. The report, which went viral no sooner than it was posted, was roundly denounced and successfully highlighted as the handiwork of a scam artist. Why was the same fake news recently resurrected when the election is all over in the state? Why are these characters unable to reconcile themselves to APGA’s preeminence in the state as typified by the party winning 24 out of the 30 seats in contest in the March 9 House of Assembly election? Worse, the same group notorious for forgeries and fake news over the years has even gone to the extent of attempting to scandalise the Anambra State legislature by alleging that the 2019 Anambra State budget estimate was not properly passed into law. Unable to get a mainstream media to publish its allegation on grounds of an awful lack of credibility, it sponsored the poorly written report in an obscure online newspaper for an incredibly amount of money. This tiny band of e-rats and their sponsor must realise that the 2019 general election is over in our state. It is now time for serious business. It is time for governance. To fiercely insist on propaganda and politicking, the divisive kind of politics that takes our focus away from high purpose, is to sabotage the future of our people. History will be harsh on such petty-minded persons who, in their myopia, think they are sabotaging only the current administration in the state. There is something to learn from Obiano’s constructive engagement policy. This is a policy, which makes us recognise the limits of party politics. It makes us acknowledge that even though our people belong to different political tendencies, we are all brothers and sisters who should, at the end of it all, be preoccupied with the rapid development of our homeland and the enhancement of the people’s living standards. The task before the Nigerian political class is urgent. There is mass poverty in the land owing to decades of refusal to do the right thing. Unemployment is alarming. Education is in a shambles. Electric power is a mirage. Basic infrastructure is in a sorry state. Industries are collapsing. International investor confidence is far from what it should be. Science, technology and engineering, which are the bedrock of modern economic development, are in a mess. Our values are at an all-time low. In Anambra State, we are faced with the challenge of being the first state to start paying the new national minimum wage of some N30,000, which will balloon the wage by N1.4 billion monthly. There are about 120 active road sites plus bridges in the state — and the number is increasing. Huge investments are needed in agriculture, security, technology, social services, and so on. The Nigerian class should bring to an end the culture of endless politicking. They should be rather concerned with the country’s transformation, as we have seen in Hong Kong, Indonesia, Malaysia, South Korea, Singapore, Taiwan and other Southeast Asian places, which successfully adopted the strategy and philosophy known as developmentalism. Some have within a generation, or 30 years, jumped from Third World status to First World. Governor Obiano is an admirer of the rapid transformation of these nations and territories, and we can see the effects in Anambra State today. For Anambra State, this is the time for serious business. It is the time for governance. All arms of the Anambra State government are ready.